Samurai have gone through many changes in position and rank over the years, starting from a basic rank of foot solider in the Japanese army. Here the then samurai would fight wars and did not resemble the traditional samurai image we know today. In this position the samurai would be civil servants and form the lower part of the order in the civilization. They would be expected to provide their own weapons and clothing but were given exception from taxes in return. Samurai in their early form would fight in wars or take jobs as bodyguards to protect tax or debt collectors from bandits and thieves. Their swords and arms served as means of a deterrent to any potential crime or attempt to rob or steal from a debt collector. 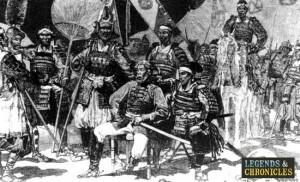 Later the samurai would evolve from uneducated warriors into those of skilled fighters with codes and etiquette, however it would be a slow transition with the samurai getting special privileges and higher ranking status in Japanese society as time went on. This benefit was extended as the samurai mastered not only how to be warriors but also studied the arts and culture embracing a variety of skills that would allow them to become a well recognized figure in the current society. In even later years the Samurai would be so respected and hold such gravitas that they would eventually dominate the government. Samurai knew martial arts and were usually well skilled in these and use of a sword. Samurai were followers of “kyuba no michi,” which translates as “way of the bow and horse”. Their code of ethics known as ‘Bushido’ is just as apt meaning ‘The way of the warrior’. Samurai tactics employed the use of various weapons to attack at close, short and long range. Regardless of the image the samurai has of using only swords they would use long range weapons like bows and arrows to attack the enemy from long range. In the most common form a samurai would be dressed in ornate armour which would be flexible yet offer the samurai warrior protection in key areas. Helmets were common and usually made from iron and leather, and were often intricately designed and quite striking with horns rising up giving the samurai more height and implosion. The Katana is the weapon that symbolizes a Samurai warrior. Usually forged from two metals and finely crafted the katana was an important part of a Samurai’s life. While the katana was not the first weapon to become a Samurai’s choice it would be in later time and was often so important that the katana would receive a name and be considered a living thing.